The recent school shootings have rocked the hearts and sensibilities of our nation. These terrible tragedies almost seem unbelievable, and yet they happened. As we attempt to understand why they happened, and seek to prevent further occurrences, are we looking in the right places for answers? Solutions have been put forth ranging from banning guns to mental health checks to reevaluating the violent video games that our children play. While the motives of those considering these solutions are most likely pure, they miss the underlying cause, and thus the solution, to the problem. This article will examine the foundational cause of gun violence and then offer the only true solution to the problem…the Biblical solution. The more humanity seeks to live by its own rules, rejecting God’s lordship, the more we see the results of doing so. Lost humanity craves autonomy; they seek to exercise their perceived right to rule their own lives. As long as this thinking permeates society, we can expect to see behavior such as that exhibited in Sandy Hook and Columbine. When we reject God’s way of doing things, there is simply no other outcome. This is what rebellion against God results in. It is a high cost to pay. Although motivated by the right spirit, the solutions that are being offered are aimed at the symptoms, not the root cause, of the problem. Laws tend to affect only the law-abiding person; the criminal couldn’t care less about new legislation. Even mental health solutions are too often temporary and incomplete. The problem lies in the hearts of men and women who are living in rebellion to God and contrary to how He intends for us to live. A relationship with God is the biblical solution to violence…a change of heart. God knows our hearts and the Bible is His Word to us; therefore, we should understand that the Bible’s assessment of humanity is absolutely accurate. In His Word, we find a concise critique of humanity’s inward condition, “The fool says in his heart, ‘There is no God. '” (Psalm 14:1a ESV; cf. 53:1-2). The first verse of this chapter tells us that this person lives as if he or she believes there is no God. This verse makes it very clear that God calls this kind of attitude ‘foolishness’; and this fool’s heart results in foolish behavior, “They are corrupt, they do abominable deeds, there is none who does good” (Psalm 14:1b ESV). The Bible’s pronouncement on the heart of man is that it is bent on rebelling against God and instead carries out evil, selfish works. Again, God says that man’s lost condition is one of bleak hopelessness, “They have all turned aside; together they have become corrupt; there is none who does good, not even one” (Psalm 14:3 ESV; cf. 53:3). There is not a single person who has ever lived, or ever will live, who is capable of doing good outside of a saving relationship with God. Moreover, lest we think this is confined to Old Testament times, the apostle Paul quotes this exact passage in Romans 3:10-12; where he says that this is the condition of everyone who has not entered into a saving relationship with God through faith in Jesus Christ. Nevertheless, the next verse is a picture of God’s grace, “The Lord looks down from heaven on the children of man, to see if there are any who understand, who seek after God” (Psalm 14:2 ESV; cf. 53:2). Instead of unleashing His holy judgment on humanity, He hopes that more people will love and worship Him. The Bible is clear that God, “…desires all people to be saved and to come to the knowledge of the truth” (1 Timothy 2:4 ESV), so that, “…all should reach repentance” (2 Peter 3:9 ESV). We are reminded from the Old Testament that God takes, “no pleasure in the death of the wicked, but that the wicked turn from his way and live” (Ezekiel 33:11 ESV; cf. 18:23). It is clearly the heart of man that causes him to do the unspeakably evil he does. James writes, “What causes quarrels and what causes fights among you? Is it not this, that your passions are at war within you? You desire and do not have, so you murder. You covet and cannot obtain, so you fight and quarrel” (James 4:1-2 ESV). Sinful humanity’s natural tendency is selfishness; if not restrained by laws or societal pressure, he will do whatever it takes to get what he wants. Many of the most heinous crimes have been perpetrated out of anger, lust or desire, the need for vengeance, or the lack of what we have deemed ‘self-esteem’. People have acted out in terrible ways attempting to quench the need for these, and other, emotional needs. However, these needs can only be met in a relationship with God. This relationship is the biblical solution to violence…a change of heart. When one turns his or her heart over to God, He washes that heart clean and gives it new desires. No longer will anger, loneliness, heartbreak, or any other selfish “un-Godly” thought be one’s motivation. The desires of the Holy Spirit replace those evil fleshly desires; one is filled with life and peace and the former tendencies are done away with (Romans 8:5-7). A person whose heart is joyful does not commit things like the horrific acts we have witnessed of late. There is no other permanent cure for violence, gun or otherwise, except the complete regeneration of a person’s heart by the indwelling of the Holy Spirit. This only comes when one repents of his or her sin and dedicates their lives to loving and serving God. “The heart is deceitful above all things, and desperately sick; who can understand it?” (Jeremiah 17:9 ESV). There are no laws, statutes, or any other man-made idea that can stop the violence man perpetrates on other men. The problem lies in our hearts, and only God can change the heart. There is no other solution to this problem. 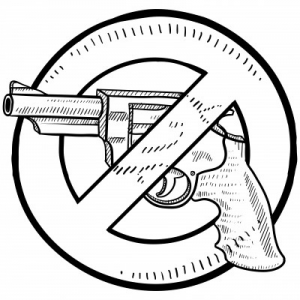 Restricting, modifying, or adjusting laws about guns will not stop the violence. It will merely alter the forms through which violence manifests itself. Even addressing mental health issues, without leading people to the Lord, will prove ineffective in the long run. Only a heart change will result in a real cure. Humans, in their lost condition, are sinking in a morass of immorality that will eventually lead to an eternity of misery, separated from God and His love. The kinds of tragedies that we are seeing should serve as a wake-up call for humankind. It should make it painfully clear that we are doing something wrong. It should cause introspection on an individual, national, and even global level. Hopefully, that introspection will be the start of the path toward Jesus Christ and salvation through faith in Him. Those without a relationship with God should consider what their rejection of Him is costing. As long as one has breath, it is not too late to repent. Christians should be even more motivated to live, and love, as the Lord leads; never missing an opportunity to represent Jesus Christ to someone else. We have the answer, but we must proclaim it to others. The Gospel is what is needed to change the hearts of the lost and to lead us to more Christ-like existence while we are on this planet. Let us prayerfully consider what God’s will is for us concerning this intensely important issue. I want to thank you for writing this article. I found it to be well constructed. I pray this will open the hearts of many people. I believe when we fall out of worship with the Lord, Satan and his demonic forces have the upper hand on the people. This Spiritual War is becoming so intense, we are taking casualties in the Physical Realm. I see all these events lining up perfectly with the Bible. I see it playing out as Biblical Prophecy. It all must come to pass. In this battle, we must remember to remain steadfast in our relationship with Jesus. He has actually already won the war. God bless you. Amen Robert. You addressed the problem and it is a heart issue and not a law issue. I love how you went to the root of the problem my friend and the human heart is desperately wicked and full of deceit and only the Holy Spirit can turn it from stone to flesh. Thank you for your strong theologically sound work here sir. Laws won’t change people’s hearts, the laws merely attempt to control outward actions. However, if the heart isn’t changed only the method by which it carries out its evil will different. The Bible is replete with examples of those who have turned from God, the results are not pleasant. God bless you, brother. This is honestly the most thorough, well written article I have read on this subject. Thank you Robert. It amazes me that more people do not see the core issues with the heart in these violent crimes. I hope and pray that this nation will wake up and cry out to Jesus for repentance of sin. I so look forward to the day when this is all behind us and we are in glory together, where pain and suffering cease to exist. Well done brother! Yes, we should hope and pray to open violent men’s hearts to God. However, whilst that is happening, greater gun control should be sort through legislation! I really wish that gun control would work. That would be great. But unfortunately, criminals don’t follow the law. That’s why they’re criminals. I think gun control will make people “feel safer”.. but I don’t think it will actually make people safer. 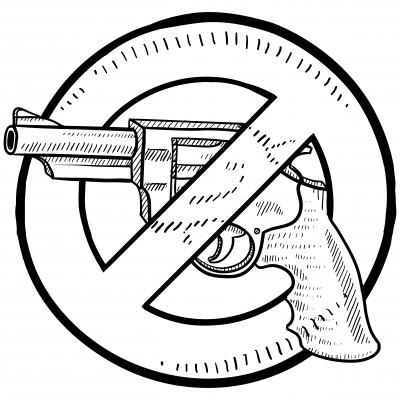 Think about it… putting a sign up at school that says “No guns allowed…” makes parents feel like their kids are more safe. But the sign doesn’t stop a criminal from entering the school with a gun. Now turn that sign into a law. Does it change anything? Not really.. it just gives us the false feeling of safety. Until Jesus returns, there will continue to be violence. That’s why I’m so thankful that I live in a country that gives me the right to defend myself against lunatics. I agree. While the true solution relies on a right relationship with God, I do not understand why assault rifles and bump stocks are legal. If people at spiritually sick and have turned from God, why make weapons of mass destruction so easy to obtain? You’re absolutely right on topic. I still will have a gun.. in order to protect my family from a crazy person when I have no other choice. However, you can’t win this debate through legislation. Only Jesus Christ will fix the gun problem upon His return. I’m sure the parents and loved ones of the victims of violence are more than aware of evil residing among them. If this had happened to my son, I have grave doubts what my relationship with God would be. We are called to forgive the sinner as Jesus forgives us, right? I became very aware that when God was taken out of the classrooms, courts, etc., that’s when these horrors began. Yet I find it most difficult to comprehend God’s Reasons for allowing such evils. Please pray for me, Robert. Trying to balance the love of God with the evil we see in the world has occupied the minds of great theologians and simple laypeople for centuries. The answer must lie in the sovereignty of God. In order to allow men and women to make free choices to follow God, He must also allow them the freedom to reject Him and choose evil. God will eventually judge everything as it should be judged. The evil man or woman who seems to get away with evil here on earth will have to pay for his or her sins when God judges them. It is difficult for us to have the same kind of patience God has. We would rather see justice done now. (As a matter of fact, the Old Testament puts forth the idea of swift justice as the right way to handle evildoers, but that’s another issue). We shouldn’t blame God for the evil that people commit, we should look to Him for comfort, guidance, and the ability to behave as He would have us behave. I hope this helps…and I surely will be praying for you. This is a tough issue to work through, but God is good and He loves us. Thank you so much for your reply, Robert! One thing I want to make clear…I do NOT BLAME GOD for the evils in this world. I’m aware of the ‘battle’ between good and evil since Adam & Eve committed the first sin of disobedience. Thank you for the reminder to ‘look to God for comfort, guidance, and the ability to behave as He would have us behave.’ I think when I first read your article on gun violence, I was feeling as a Mother, like those Mothers who had lost their little ones. I hope I wasn’t ‘out of line’ when I replied to you, I meant no disrespect. Would you offer a prayer for my son, Chris, who’s now 36? He believes in God, but does not have a relationship with His Son, Jesus…which I believe is most important, as Jesus said in the New Testament. Oodles of blessings for you and your family, Robert! You certainly were not ‘out of line’ at any time in our correspondence. This issue has a very emotional aspect to it, for sure. As for your son, Chris, I will indeed be praying for him (as will all who read these comments, I hope). The Bible indicates that everyone believes in God (or at least the fact that He exists); however, the Bible makes it very clear that it is belief (faith, trust) in Jesus that saves us, “Whoever believes in the Son has eternal life; whoever does not obey the Son shall not see life, but the wrath of God remains on him” (John 3:36 ESV). So, you are very right in wanting your son to have a relationship with Jesus. God bless you, Patty. I pray that these articles continue to strengthen your faith and bring you closer to Jesus. Thank you for this well constructed and soul inspired mesage. The fact is, we need to give thanks for existence of Bible. If not so, I don’t know how the world will look like now. The question is why are the World Powers promoting live destructive technology in favour of life saving. The solution Is to have a touch of God in one’s hearth and let Jesus reign therein; it is then we can have a peaceful world. Thanks. My prayer is that more and more people will realize that our rebellion against the Creator is what is bringing about all the evil we see around us, and I pray they will repent and begin living their lives in humble submission to His will. God bless you richly.